Slows Skill Leveling, with option version to fix several skills that level way too fast. Tired of how every little thing you do in skyrim levels you up ? Feel you're limiting which skill you use, or dungeon to visit because you're afraid of leveling up and the whole world changing ? Want to play a game where you max your character towards the end of the game and not in the beginning ? Slowing down leveling encourages exploration, challenge and also more forgiving if you want to use unrelated skills every once in a while. This mod was inspired and created with the help of Slower Leveling with tutorial. Slower Leveling can be install/used/removed at any time without messing your saves or character - because it only slows down actual skill gain. That also means it won't mess up with skill/levels ratio. Based on values of latest Skyrim version 1.7.7.0. For Skyrim SE version, check the mod port by BlackGorath. Normal version - simply slows all skills by a given factor, choose between 2x / 3x / 4x /5x . Help, I don't know which factor to use ! There's a quick trick to find which ratio is good for you in 2 minutes. • Now you can see the character level/skills/equipment you would have been if you used scaling. • Again, remember there is only so much content in the game, That's why I personally use 2x. • Enchanting - Basically it makes it slower at lower levels, but higher levels are the same. The reason was that it's way too fast at lower level, you practically level up skill with every enchantment. 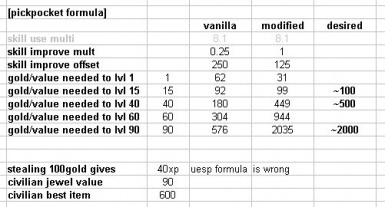 Unfortunately skill works on flat rate regardless of enchantment/soulgem, so making it slower on higher levels would just turn it to grind. • Pickpocket - same early on, but up to 4x slower towards end of skill. previously would level up almost on every theft, especially as you get higher value theft loot as you progress. • Illusion - made is closer to other magic skills - 3x slower early on, up to 1.5x slower towards end of skill. previously a character like a thief for example would level illusion twice as fast as stealth, that made no sense and could break a playthrough build. • [1.1] Illusion - skill improve multi 3, skill improve offset 500. 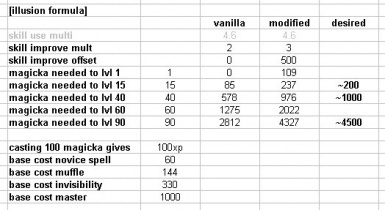 • [0.8] Enchanting - skill improve multi 0.9, skill improve offset 1333.